Nestled next to Peace, Love and Little Donuts on Meyran Avenue sits a small, family-owned shop selling homemade Indian food. A colorful sign hanging from the top of the building reading “Sree’s Foods” welcomes customers into the quick-service restaurant. Sree’s Foods is a restaurant that serves authentic, homemade Indian cuisine. Sree’s has gained a considerable following in Pittsburgh for its vegan and gluten-free options, with the majority of its food considered safe for most dietary restrictions, from vegetarian to dairy free. Sree’s currently has two locations — one in Oakland and one Downtown on Smithfield Street. The Downtown location came first, while the Oakland location opened recently, in June 2017. A friendly man behind the counter made me a dish called spicy coriander chicken, served with rice with a spicy sauce. The meal also included eggplant curry, a mixture of chickpeas and potatoes, some yogurt salad and a tortilla — and the whole meal only cost $7. I took a seat at one of the three tables in the small restaurant that does mostly carry-out business, ready to give the homemade food a taste. The man behind the counter was Shiv Reddy, who runs the business with his wife Vydehi Reddy — commonly known as Mrs. Sree to regular customers. They are the only two employees at the Oakland eatery, which might explain the business’s limited hours: Monday through Friday, 11:30 a.m. to 2:30 p.m. for lunch and 5:30 p.m. to 8 p.m. for dinner. Despite the modest staffing, there was plenty of food to offer customers, and my plate was overflowing. At the first bite, I was intrigued and satisfied with the savory flavor of the spicy coriander chicken. I was excited to try the side of yogurt salad, which was something I had never had before. It was similar to potato salad, except instead of mixing potatoes and eggs with mayo, fresh veggies like cucumber and tomato were mixed with yogurt. The vegetables in the salad were so fresh and flavorful, I could have eaten a whole plate of the salad, but I tried to control myself to save room for the eggplant curry. As I chatted with Shiv, some of his regular customers — mostly students — came through the restaurant. One Pitt student, junior neuroscience major Varun Rao, said as a frequent visitor to Sree’s, the eggplant curry was his favorite dish. After tasting the eggplant curry, I quickly agreed with Rao — it was the best part of my meal. These fan-favorite homemade dishes were first offered to the public when Vyedhi opened Sree’s Foods’ first location in 1991, while she was married to her first husband, Sreevardhan Mekala — known as Sree. Vydehi preferred cooking to working her marketing job. According to the restaurant’s website, Vydehi was tired of her monotonous office job and the travel it required, so she decided to pursue her first passion — cooking — as a full-time job instead. She uses traditional cooking methods learned mostly from her mother, but also techniques she picked up at the Cultural Academy in Madras, where she studied cooking, nutrition and household management. After Sree passed away in 2011, Vyedhi was still able to keep their business alive. Recently she married Shiv, who was more than happy to help run Sree’s Foods. “For so many years, I worked in IT, and as soon as my son was stable and had a job of his own, I was happy to be done with that job,” Shiv said. Shiv said most people who become regular customers are lovers of spicy foods, and I quickly understood why this might be true. 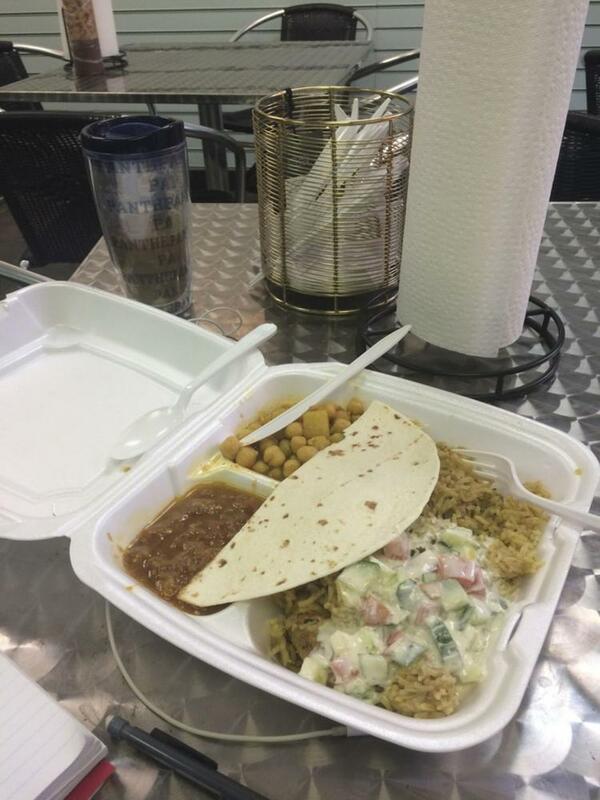 The spicy flavors combined with homemade quality and freshness of the food made Sree’s a lovely change from the blandness of a typical college student diet. The restaurant’s website says the cuisine served at Sree’s has its roots in the city of Hyderabad, an ancient city in southern India. Hyperbadi cooking combines two different Indian food traditions — “rich court cooking usually associated with the Moghul north and the traditional vegetarian cooking of India’s south,” the website says. Ingredients and spices that might indicate northern-style food include cinnamon, cardamom, cloves and garlic, while southern flavorings such as curry, red chilis, mustard seed, coconut, tamarind leaves and pathri are all utilized in Hyperbadi food. With a price tag of $7 for a homemade meal full of spicy flavor and rich in history, I think I will be making more trips to Sree’s in the future. Mrs. Sree and Shiv have gained a new regular.